Here we have a short story with nary a mention of Ellery Queen. 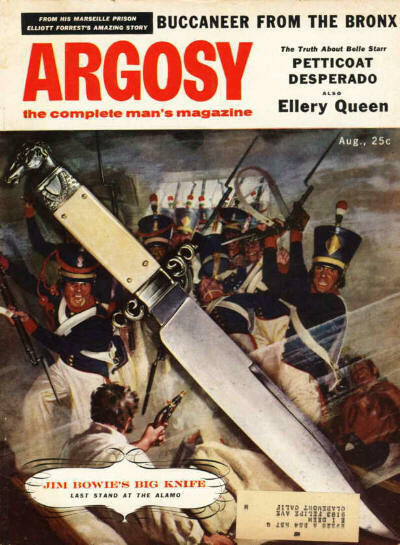 It appeared in the legendary, long-running fiction magazine Argosy (1882-1978), and was adapted, as “Terror in Northfield,” for the Alfred Hitchcock Hour (Season 2, Episode 3) in 1963. It was finally anthologized with other Ellery Queen stories in The Tragedy of Errors (1999). This is a well-written short story with murder and romance intended for a general audience, and which deals with rather disturbing issues. Bodies keep turning up in the exact same place in a small New England town, and the local deputy sheriff has no clue (literally) as to the killer’s identity, or even motive. The townspeople turn their fear into anger, but the hero stays his course, and discovers not only the purity of his love for a childhood sweetheart, but the anger and delusions that has led a man to murder. Tommy Cooley was found in the spring. There are holes in the story, but it is an enjoyable read, especially when you consider how much more human the characters are compared to the days of The Roman Hat Mystery. In a way, by this time, the pendulum has swung to the completely opposite place, with fleshed out characters, shoddy crime construction, and no sign of Ellery Queen.